Composed of 90% Cetyl Stearyl Alcohol and 10% Sodium Cetylstearyl Sulfate derived from vegetable oils (coconut / palm kernel). 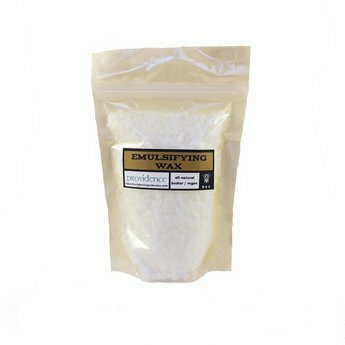 Our emulsifying wax is an ionic self-emulsifying base specifically for oil and water cosmetic lotions and creams. It is PEG-free and gluten-free, and is approved by Ecocert for use as an ingredient in natural and organic cosmetics. Use it to combine oil and water for lotions, creams, body butters, and more. This is, by far, the easiest to use emulsifier and is highly recommended for beginners. More advanced options for emulsifications include using lecithin and beeswax/borax. This emulsifying wax does thicken products slightly and does not leave a greasy film. store this wax in a dark cool space. Allergic reactions, although rare, do exist.